Way back in August of 2004, I reviewed Plain Clip, a useful tool for those who frequently work with formatted text. I continue to use Plain Clip many times each day, but since my original review, the program has been updated significantly enough to warrant another look. One of the simplest Gems I’ve ever covered, all Plain Clip does is strip formatting from text on the Clipboard so that when you later paste that text, it takes on the formatting of the target document. Stripping formatting also removes any images and other non-text content; so, for example, if you copy the contents of a Web page and then paste it into a formatted document, you get just the text, omitting images. Finally, this functionality is also useful when you want to copy the names of files selected in the Finder and then paste those names into a document or a Mail e-mail message. If you don’t strip “formatting,” you instead get images in your document or, in Mail, the actual files included as attachments to your message. Unlike many other utilities that strip formatting, Plain Clip does its job quickly and invisibly. When you launch Plain Clip, it doesn’t show as a running program in the Dock, it doesn’t have menus or windows, and you don’t have to manually quit it; it just silently strips formatting and quits. You can then paste your now-plain-text content wherever you need it. This means you can put the Plain Clip icon in the Dock, assign it a shortcut using a keyboard-macro utility, or access it using a "launcher" utility such as LaunchBar. Plain Clip 2, released a few weeks ago, adds four new features. The first two are the capability to remove spaces and tabs from the end of each line of text, and to remove invisible characters such as non-breaking spaces. You access these options by holding down the shift key while launching Plain Clip. But it’s the other two new features that have made Plain Clip so much more useful to me. Until recently, my workflow for stripping formatting from text was: copy text; press command+space (to bring up LaunchBar); type p c return (to launch Plain Clip via LaunchBar); switch to the target program; and press command+V (to paste the text). Although that sounds like many steps, it took only a second or two to execute. But Plain Clip 2 makes the process even easier by including an option to automatically paste stripped text and by integrating with macro and text-expanding utilities. The way PlainClip offers these two features is by including, within the program’s package, a shell (Terminal) script that can be run from within other programs. Assuming you install Plain Clip in the main Applications folder, the path to that shell script is '/Applications/Plain Clip.app/pc'. The script provides the same options as the main program for removing trailing spaces (-w) and removing invisible characters (-i), but adds the unique—and uniquely useful—capability to paste freshly-stripped text (-v). Executing that shortcut strips all formatting from the Clipboard and automatically pastes the stripped text into the current program. do shell script "'/Applications/Plain Clip.app/pc' -v"
For example, I use TextExpander to reduce the amount of typing I do each day. TextExpander’s big feature is automatically replacing short bits of text with longer chunks; when I type addy and then press the space bar, TextExpander replaces addy with my full shipping address. 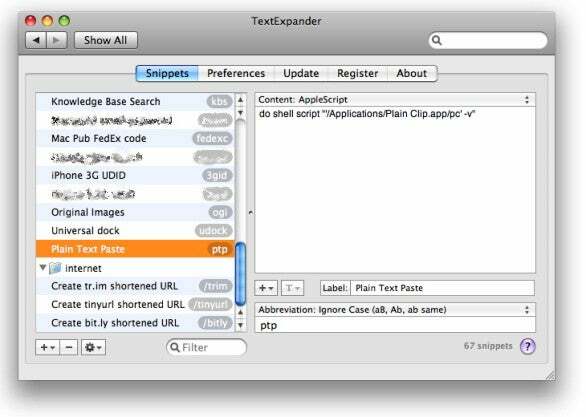 But TextExpander can also run AppleScripts and shell scripts. So I’ve set it up to run the aforementioned line of AppleScript code whenever I type ptp (my personal abbreviation for “plain pext paste”). This means that the many-step workflow I described above is now just: copy text; switch to the target program; and type p t p space. It doesn’t get much more efficient than that. It’s a testament to Plain Clip’s usefulness that I’m still using it, on a daily basis, nearly four and a half years after first covering it. The latest update ensures I’ll continue to use it for quite a while longer.